Sundays can be a dangerous day in our household due to the abundance of home improvement circulars that arrive with the morning paper. The danger becomes quadrupled when you invite friends over for an early afternoon brunch and share a pitcher or two of sangria. Now don’t get me wrong: I’m all in favor of socializing. But this one particular Sunday, we were sitting inside lamenting the fact that our deck wasn’t large enough to hold a patio set and discussing how nice it would be to sit outside. And then it began: the circulars and scratch paper came out, and we were off on a quest to replace our old deck with a new, larger and stronger one. We initially thought we would buy a pre-designed deck kit, but within minutes of looking through the circulars, we discovered that our space wasn’t suitable for any of the readily-available kit projects. And besides, we all decided it would be so much more fun to design it ourselves! As always, we had different options for materials. First we looked at composite decking, which is made from a mixture of recycled wood fibers in a resin base. Composite has several advantages, the primary one being that it is low maintenance and resists splitting, cracking and warping. Composite is available in a textured finish that resembles wood, and is offered in a variety of colors, including brown, buff, gray and redwood. We rejected the composite decking, however, because it was expensive and none of us had ever worked with it before. We turned our attention to natural wood, where we looked at four options: cedar, redwood, pressure-treated pine and natural, non-treated pine. Both cedar and redwood are extremely lovely and wear well, but are very expensive, so these were out. Non-treated natural pine was the least expensive option, but would require constant treatment with stains and sealers, and even then, we would have to replace it after four or five years of use. So we settled on pressure-treated pine, which is durable and weathers to a lovely gray hue. 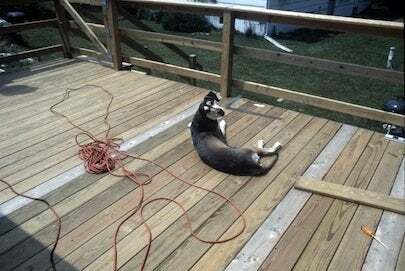 We wanted to minimize the amount of carpentry and cutting we would have to do, so we designed the new deck to be 12’wide by 20′ long, thereby allowing us to purchase 12-foot lengths of decking, and six-foot lengths of 2″ x 8″ support beams. For the frame joists, we went with 10-foot lengths of 2″ x 8″ beams, all supported by 4″ x 4″ upright posts. We used 10-foot lengths of 2″ x 4″ for the railings, topped by decking. 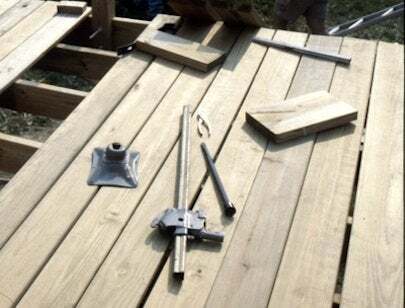 We went with stainless steel for all of the hardware, which included lag bolts for the uprights and frame joists, hangers and brackets for the support beams and screws for the decking. One of the factors that contributed to the demise of our old deck was the lack of footings, so we rented a two-person auger and dug 48″ deep holes, which we filled with ready-mix concrete. 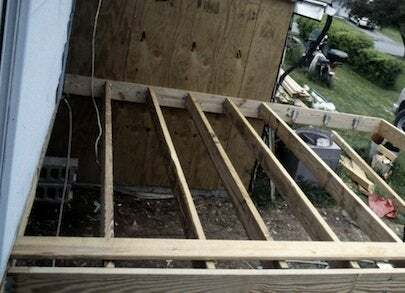 Once the footings had set and cured, we placed the 4″ x 4″ upright posts in brackets on the footings, and framed out the deck with the frame joists, which we secured with lag bolts. We added the support beams, which we supported with brackets, hangers and lag bolts. Finally, we screwed down the decking over the beams, added railings and stairs, then purchased a nice, new patio set and toasted our success with yet another pitcher of sangria! The deck close to being finished. I’d like to say the whole project went off without a hitch, but then I would be lying. As with many of our home improvement projects, there were a few bumps in the road to success with this project… but I’ll deal with those in an upcoming installment: The Great Deck Build, Part 2—The Importance Of Flashing.